Simple Green Lime Scale Remover, Wintergreen, 1 gal, Bottle, 6/Carton - Lime Scale Remover uses an organic salt formula to dissolve lime scale, mineral deposits, hard water stains, soap scum and oxidation. The nonabrasive formula won't strip protective finishes, cause discoloration, etch or damage sensitive surfaces like other harsh descalers. It is still strong enough to remove long-term scale buildup from equipment and machinery. The nonabrasive formula is safe for ceramic, glass, stainless steel, aluminum, chrome, copper and other surfaces found throughout kitchens, bathrooms, locker rooms and breakrooms. It can safely descale equipment, pipes, hoses, tanks, spray rack systems, washing machines and more. 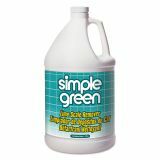 It can also be used to increase efficiency and restore clarity to landscaping equipment and building exteriors including spigots, sprinklers, lighting, windows, furniture and more.